"Unplanned" is not an easy film to watch, but it is filled with truth and grace. For those individuals who gather and pray for women entering abortion clinics, don't stop. Many change their minds and leave. For those who work and volunteer for pregnancy counseling centers across our country, offering prenatal care and alternatives that bring life rather than take it - be encouraged and keep up the good work. You're saving lives. This is a courageous film about a courageous woman, and it takes courage to watch it. Have tissue handy. In the end, it offers healing, redemption and hope for the future. " Unplanned is a heart-stopping personal drama of life-and-death encounters, a courtroom battle, and spiritual transformation that speaks hope and compassion into the political controversy that surrounds this issue. 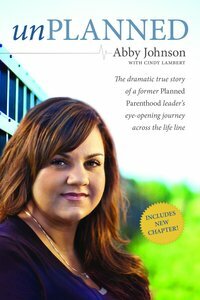 Telling Abby's story from both sides of the abortion clinic property line, this book is a must-read for anyone who cares about the life versus rights debate and helping women who face crisis pregnancies. Now updated with a new chapter covering the latest events in Abby's journey, in the news, and in changing legislation ... and revealing the impact Abby's story has had in the most surprising places. Customer Reviews For "Unplanned (New Edition)"
This item is being reprinted. There will be a delay in fulfillment of your order. eBook is Available.